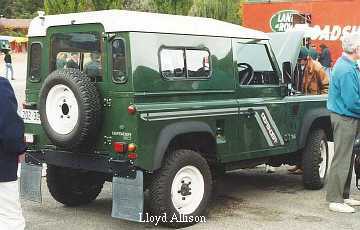 1990: The Defender name was introduced, for what had been the 90-110 range, to cash in on the military connection. 1994: R380 5spd full-time 4WD transmission used. 1994 late: Engine limited to 300-series 2.5L TDi (except to special order). 2.5L TD, 5spd (R380), full-time 4WD, locking centre diff. Unladen 2110kg, GVM 3500kg, payload 1390kg. 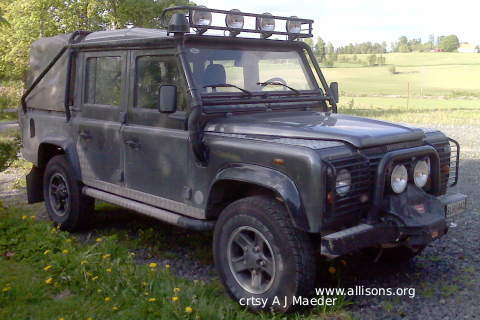 1998/ 1999: The Land Rover Defender got the new Td5 5-cylinder turbo-charged, intercooled diesel, in place of the 300-series 4-cylinder engine. 2001 prices: 110 Chassis cab Td5 manual $37,563, 130 Chassis cab Td5 manual $41,940, 110 Wagon Td5 manual $38,033, 110 Xtreme Td5 manual $41,790, 130 Crew cab Td5 manual $44,618, air con' +$2.65K ($au 3/2001). 2001 June: A V8 HCPU has a bit-part in 'Lara Croft, Tomb Raider', the movie. 2001 late: The 2002 m.y. 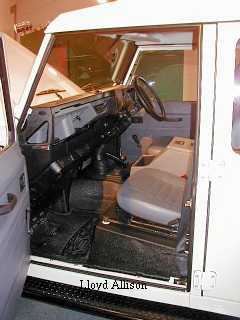 Defender gets electric windows and one key now operates the doors and ignition (and remote locking). Heated seats and a heated wind-screen are options! The rear station-wagon style door is stronger and of zinc plated steel. 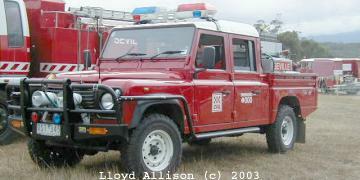 2002 October: LandRover announced it would start imports of the short wheelbase LandRover Defender 90 into Australia. "Australian specification Defender 90 will be available in a two-seat hard top wagon with 2.5-litre five-cylinder turbo diesel engine capable of 90kW at 4200rpm and 300Nm at 1950rpm." Also ABS brakes, traction control (ETC) and air-conditioning. 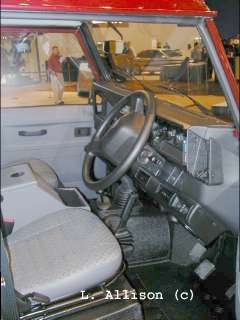 2003 February: There was a D90 Xtreme at the Melbourne Motor Show, but they are still not on sale (in .au) yet. It had electric windows(!) and the doors shut with a satisfying clunk. 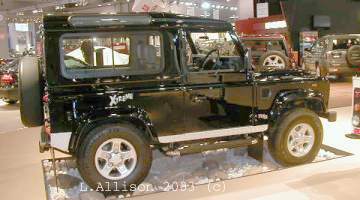 July 2003: Finally saw a new D90 Xtreme for sale -- at au$50.3K, although au$46K has also been mentioned. 110 stn wgn $48,990 (7-seats +$2K), 130 crew-cab $51,990 ($au 3/2008 +orc). 110 stn wgn £25,450 (uk, 1/2010). 2011: D110 stn wagon from au$49K +orc. 2008 June+, LR 60th anniversary: Defender SVX limited (1800 ww) edition $62,990 ($au) rrp, black 110 stn wgn with some extras, such as Recaro front seats. After a time away, the D90 returned to .au, 2-door, 4-seat (au$45K+orc 3/2010). 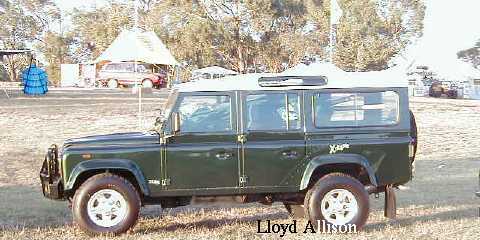 at the 2011 Victorian 4WD Show, Wandin, .au. 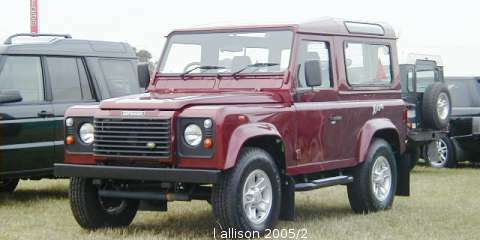 2011, August: In the 2012 MY Defender, a 2.2-litre 4-cyl. turbo diesel with a diesel particulate filter (for EU5) replaced the 2.4-litre unit, supposedly with similar performance (120hp @ 3500rpm, 360Nm @ 2000rpm), 6-speed manual gearbox, from £21K, Nov. 2011. 2011, September: Land Rover revealed a concept 'DC100' Defender at the Frankfurt Motor Show, hinting at a 2015 model? 2012, January: New D90s seen advertised for au$40K inc. orc. 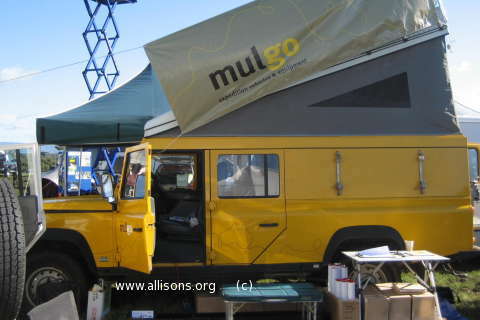 2016, Fri., 29 January: The end of production of the Land-Rover Defender (H166 HUE, the 2,016,933rd) at Solihull.